I'M GOING TO BOOKCON & OTAKON! When it comes to conventions and signings, I'm down for them! I love going out and dressing up, participating in cosplays, roleplays, and even standing in line waiting for an author to sign my book! I'm one of those people who know about the big things that go on. My only dream is to make it to Comic Con this year. Crossing my fingers! Bookcon 2015, here I come! Finally a huge book event that is taking place in NYC, since it's so near. I've been wanting to go to Bookcon since last year and was devastated when I didn't get the chance to. Well alas I was able to get the money to purchase some tickets and take a trip down there! So who's going? I would love to meet up with some of you amazing bloggers. I'm only going to be there on Sunday due to track practices and other times when I'm busy. It's sad, but at least I get to experience the fun for one day. I am most excited to meet the Booktubers from Booksplosion, Christine, Jesse, and Kat! I've aspired to be like them ever since I saw my first Booktube video. This is my first year at Bookcon so I don't expect myself to be a pro and know where to go every second of the minute. I know I'm definitely going to have to get used to crowd and tons of people in only one day, but it's not like I've never been to a convention before. I've been to Apollycon and Otakon. Otakon is a Japansese Anime Convention in Baltimore, Maryland. 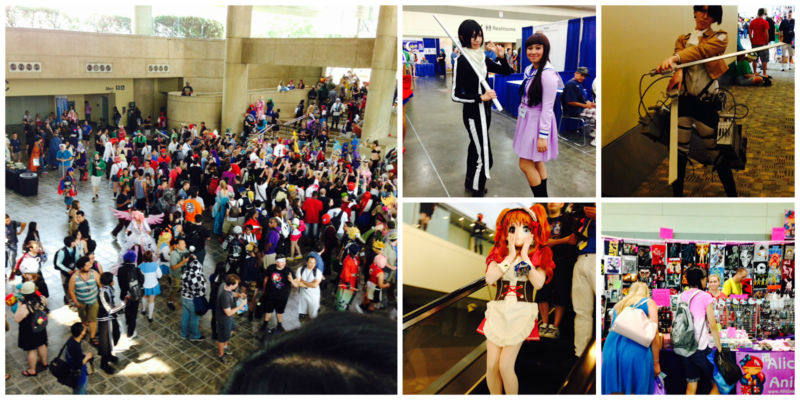 Last year, I had the most amazing time at Otakon. It's definitely one of those experiences I recommend because even though I'm not a crazy anime lover, I was able to recognize the most popular of animes. I didn't do cosplay last year but I have a very interesting costume set up for this year. Otakon is taking place at the Maryland Baltimore Convention Center from July 24-26. The tickets are about $70 for three days! ISN'T THAT INSANELY INEXPENSIVE? There were literally so many people dressed up as characters from an anime and League of Legends characters. I almost felt left out. There were also tons and tons of vendors that sold small knick-knacks, cell-phone cases, cute hats and jewelry. There were many popular anime producer vendors like Aniplex and other ones like Hiyao Miyasaki's movies. There was also something called Artist's Alley, where different artists who paid to get their vendors there, displayed most of their artwork and creations in clay. Definitely recommend Otakon if you're into anime or dressing up. You won't feel alone, I promise you that. I also liked the area that it took place in. The Baltimore Convention center and surrounding is one of the cleanest and most peaceful places I've ever been to. I can't wait to go back! Hurry up and get your badge so you'll be on of the first 10,000 to purchase from Online Registration and get your badge mailed to you! Trust me and take my advice when I say, you don't want to wait on line for the badge. It takes forever! Have you have been to any conventions? Have you been to Bookcon and want to share some tips? I would love to know!